The 4th QAC Meeting of IQAC was held on Tuesday, February 27, 2018 at the VC Conference Room of NSU. The meeting was attended by the QAC Members of North South University. Pro Vice-Chancellor (Designate), Prof. Dr. G.U. Ahsan, Dr. M. Mahboob Rahman, Dean, School of Business & Economics, Prof. Dr. G.U. Ahsan, Dean, School of Health & Life Sciences, Dr. Arshad M. Chowdhury, Dean, School of Engineering & Physical Sciences, Dr. Abdur Rob Khan, Dean, School of Humanities & Social Sciences, Mr. B.M. Isa, Registrar (In-charge), Dr. Md. 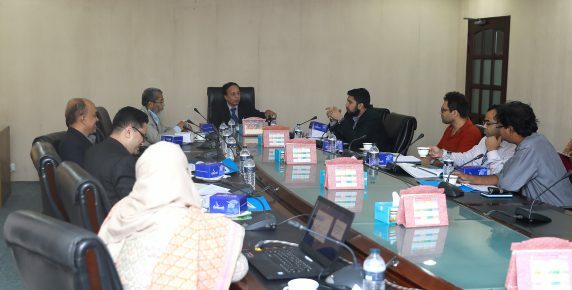 Mahmudur Rahman Bhuiyan, Director (In-charge) of Confucius Institute, and Dr. Mohammad Shamsuzzaman, faculty representative were present among others at the meeting. IQAC Director, Dr. Nazmun Nahar started the meeting by making a short presentation on the accomplishments of IQAC after the 3rd QAC Meeting that was held on August 03, 2017 till January 2018. Summary of self-assessment activities and funding issues were discussed. Moreover, a number of recommendations at institutional level were also presented in front of the QAC members at the meeting.